They’re scarier than they sound. Ru-sham-bo is a play on Roshambo (Rock, Paper, Scissors, but with Ruby!) In essence, it is a multiplayer game that flows in very much the same was as Words with Friends. You start by making a match with another player. Once you have a match, both players can start games that belong to this match. From there, players can compete to get on top of the leaderboard and vie for the best record and the highest “Ru-Rank”. This little game is in the spirit of fun and community. To build this project, I needed to allow users to create matches (connections very similar to friendships in social networking). However, I also wanted these matches to have several games as child objects. The relationships seemed complicated, but I thought they were critcal to my app. I did some research on the benefits and drawbacks of has_and_belongs_to_many relationships, but they were almost universally panned for their inflexibility. Several posts I found suggested I use some has_many through relationships. Since these are required, recommended, and suggested by my section lead I decided that was the way to go. So my objects were going to be related like this. Wonderful! Problem solved and project requirement met. Two birds with one stone (I hate birds apparently). But a problem came up when I would save new matches to the database. 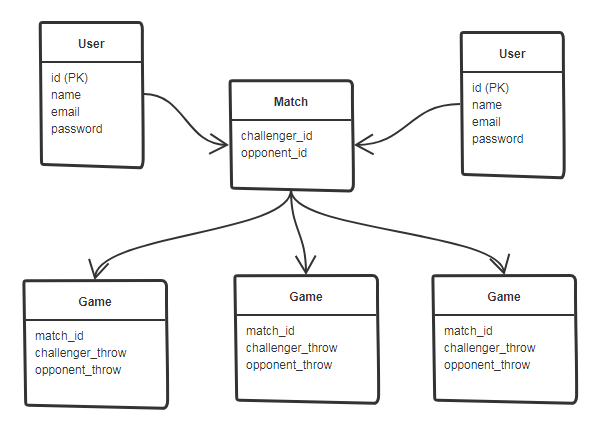 Take this example entry in the matches join table. 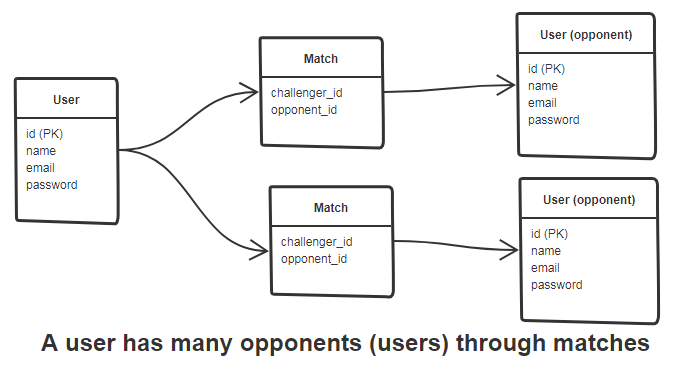 When I write a new match to the table, one user will see themselves as the ‘Challenger’ and the other user will see themselves as the ‘Opponent’. This won’t do! When I try to have users access their games, I have no way of knowing which matches they are the ‘opponent’ and which they are the ‘challenger.’ The matches should behave the same way no matter which one you are. So, I stumbled on an article that helped me get this right. Great! Another problem solved! But this opened up more problems (or birds, I guess). Now, I’ve got to make sure that when one match is created, the other is automatically created. I’ve also got to make sure that when a match is destroyed, so is its bizzarro-world twin. The article above helped me implement an automated solution. #Destroy them both when one is destroyed. #WE CAN ONLY HAVE ONE MATCH PER PAIR! Now, after every match is created an inverse match is automatically created as well. When a match is destroyed, so is its counterpart - all without me having to manage each one. Take that birds! Didn’t I solve this already?! The victory was short-lived however, when I realized that I wanted each of these matches to have child objects in the form of games. (Whose choice was that anyway?) The exact same problem had come around again! Now that I had 2 match objects for every pair of users, I would need two game objects for every game, but they’d each be linked to a different matches which were each linked to different users. Simply put, when I made a game I could easily generate an inverse game too, but how would I know which match to link it to? If only I had some method that knew which match-B went with which match -A. The gameA instance is created and linked to matchA automatically by the HTML form. When the gameA is created, a helper method would automatically create a reciprical gameB. Each game has an attribute recip_game_id that is assigned so each game knows about its twin directly! When both games have a recip_game_id present, the loop is completed. Though this problem was very frustrating, it was also really engaging to solve. I love when there are multiple ways to solve a problem; weighing their relative merits is really interesting to me. I am certain that there exists a more eloquent way to do the same thing I’ve done here. However, I am happy with the depth of understanding of AR relationships I gained from this implementation. Though it makes my database twice as large, it has held up this far an enabled me to build a project of which I am very proud!